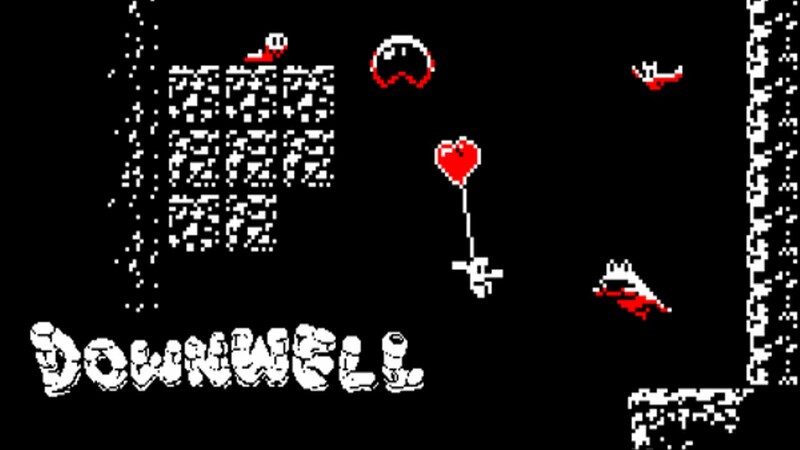 How To Be A Pro At Downwell - Tips And Tricks For This 10/10 Rated Game! Have you ever had one of those dreams where you’re just falling? You just keep falling and it seems like forever before you hit the ground. 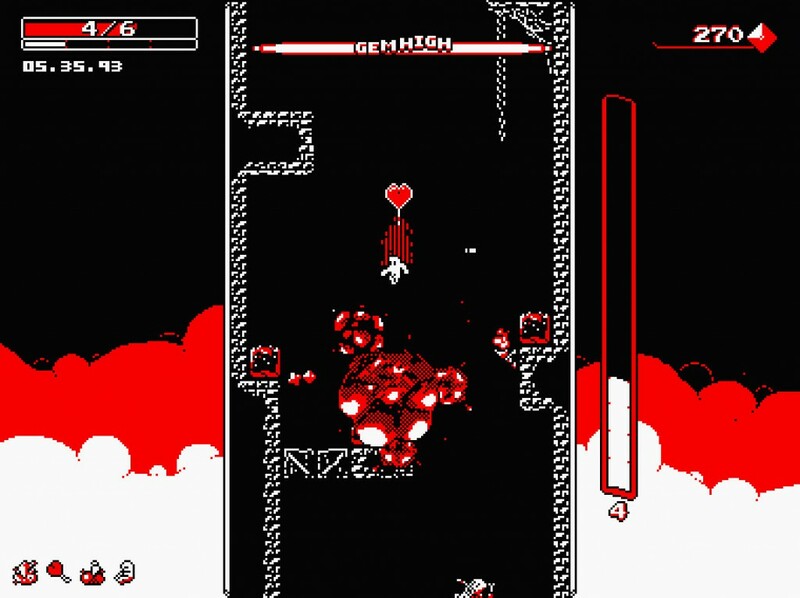 If you are looking to recreate the similar experience – where you keep falling and falling, there’s actually an app for that – Downwell. 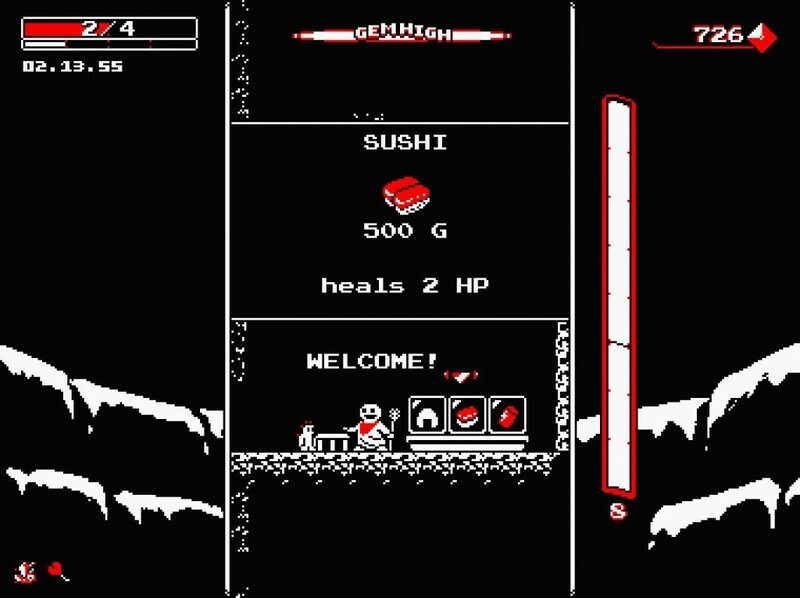 Downwell is the brainchild of a single Japanese man, Ojiro Fumoto. It’s a game where you… go down a well. 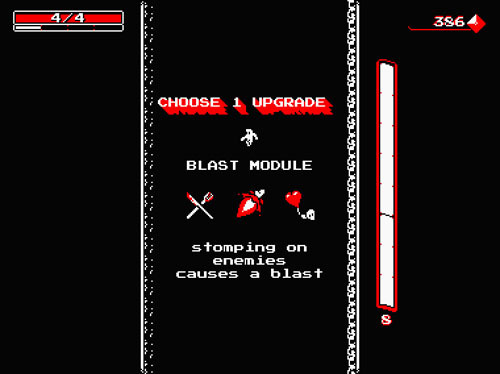 With Downwell, you control your character with three buttons — left, right, and an all-purpose action button. Pressing the action button while on the ground makes your character jump, while pressing the button in mid-air causes your character to fire bullets from whatever gun it has at the moment. It sounds deceptively simple, but there’s more depth to the game than that. If you want to be a pro at Downwell, this is absolutely key. There are two ways to reload your gun in Downwell: either you touch the ground, or you stomp on an enemy. 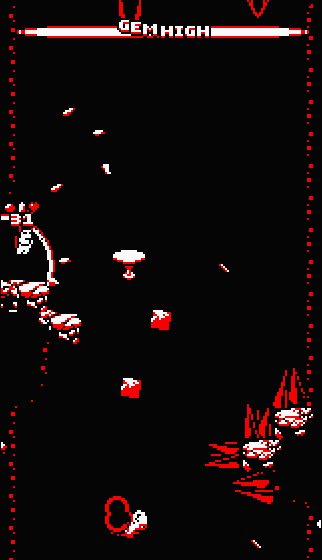 Expert players of Downwell will very rarely, if not ever, touch the ground at all. This is because not touching the ground increases your combo, and you want to keep your combo up for as much as possible because it rewards you well. There’s also a game mode unlocked through playing the game called Levitate that lets you fall slower, making it easier to keep your combo up. That being said, you need to know when to take it easy. If you’re getting hurt a lot, it’s okay to stop trying to avoid the ground and just give yourself a moment to collect your bearings. It’s not worth it to lose your life over a combo. 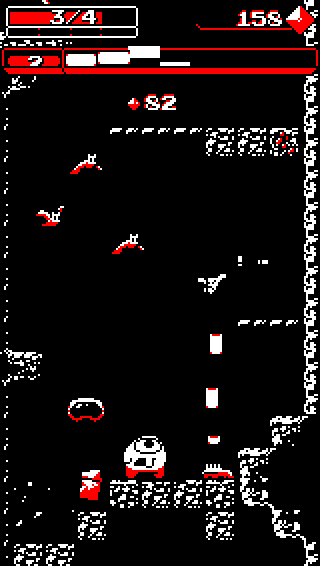 There are four different areas to Downwell — Caverns, Catacombs, Aquifer, and Limbo — each with different enemies and terrain. Each area comprises of three levels, and each level is randomly generated so that you’ll never know when enemies or traps are coming up, and you can never be too sure what pickups or upgrades you’ll come across either. The first area is the most basic of the four. There is an abundance of destructible blocks, sometimes filling the well from wall to wall so that the player has to shoot through the blocks in order to continue falling lower. The Caverns also has some wall-climbing enemies, so you might not want to stick too close to the walls. This second area contains unique blocks which will spike the player if they stay still on them too long, doing damage. Although, as mentioned before, you want to do your best to keep airborne instead of standing still anyway. Some enemies from the Catacombs (ghosts) can also move through blocks, which means that they might try coming at you again from above, so be wary! This third area is unique in that, because you’re underwater, you have a timer ticking down signifying the breath you have. Open up clam shells to prolong your breath. If you run out of breath, you lose one health. Aquifer also has coral blocks that you want to avoid because they damage you if you touch them. Also, you ideally want to kill the squids before they reach the top of the screen because they fall back down at an alarming rate and have a good chance of hitting you when they do. In addition, it appears that you fall faster in Aquifer. There is almost no ground for you to land on in Limbo. This is both good and bad. Because of the lack of ground, it’s incredibly easy to combo. However, the only way to reload your gun is to stomp on floating destructible objects, as none of the enemies are killable by jumping upon. All enemies in Limbo can pass through blocks, and appear as black balls or objects with a red outline. And then finally, after Limbo, you come face-to-face with the boss of the game which takes you back through all the areas. When going down a level, you will occasionally see openings in the wall that can lead you into a cave or a shop. These openings are signified by a circular void outlined in red (or whatever colour you have your palette set to). These voids stop time when you are inside them, and you won’t lose your combo when you go inside them either, giving you a nice pause when you find one. You buy items with gems you obtain from your combo and from killing enemies. It’s not always wise to conserve your gems because items get more expensive in shops the further you proceed. Gun pickups are either heart shaped or power box shaped, indicating that picking it up will either give health or ammo. Additionally, any heart you get when maxed out fills a little four-block white bar below your health meter and filling that will also expand your max health. Each gun has its pros and cons, so it helps to experiment with different ones to see what works best for you. I will say that though the Laser is powerful, it is the worst at keeping you airborne and therefore terrible at keeping your combo going. Knife and fork: This allows you to consume the bodies of enemies by stomping on them. Eating ten bodies will restore one health. Blast module: This upgrade creates explosions whenever you stomp on a monster, killing other enemies in the radius. Popping gems: This causes a bullet to shoot upwards whenever you collect a gem, killing enemies above you. Gunpowder blocks: This causes a bullet to shoot upwards whenever you destroy a block. If a block releases a bullet, all adjacent blocks will also go off. Both this and Popping gems are great at helping you take care of enemies above you, which you wouldn’t be able to hit otherwise. Downwell is a game that can seem punishing at first, but teaches you to be better and makes you earn your victories by uncovering skills you never knew you had. As such, being a pro takes time and practice. 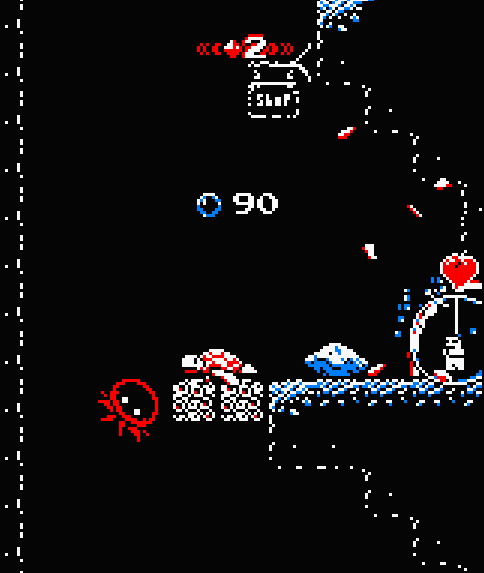 But no matter how many times you die, Downwell is a consistently enjoyable and engaging game. It truly is a game well done (get it? Well done? Downwell? Ah, forget it). 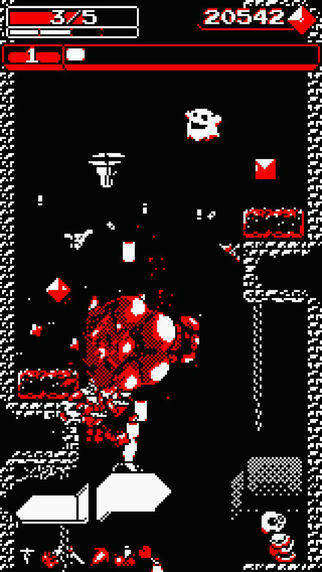 Downwell is available on Steam and iOS, and finally out on Android too.